Lough Muckno is 425 hectares of brooding, dark water flecked with picture-perfect islands. It promises the best angling in Ireland and the stretch around Concra Wood is world-renowned. It is the only one of its kind, approved by the international rules committee of C.I.P.S, that meets the standards required for international events. It is currently being shortlisted as the venue for the 2010 European Police angling Championships, the 2009 Senior Celtic Cup and a number of other prestigious events. 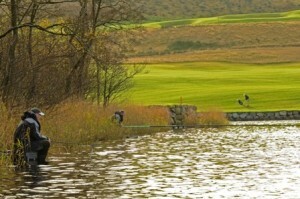 With such a reputation, Concra Wood Golf and Country Club have invested carefully to improve access, parking and facilities at the Concra stretch, providing designated fishing areas that sit comfortably alongside the golf course. Several of Ireland’s International team members fish here and it is expected that the improvements will lead to greatly increased numbers of anglers visiting the area. It is also expected that international events will be held here on a regular basis. The Concra Wood stretch along with White Island, Black Island, Yellow Island, Toome stretch all combine to make Lough Muckno the best, most prolific, most accessible venue by far that this country has to offer. N.B. Fishermen must report to the proshop prior to commencement of fishing.